Take your music with you anywhere with the best Bluetooth speakers. These wireless speakers are portable and thus you can listen to your favorite song or music station on the beach, in the park, or any other place where your friends gather to enjoy listening and grooving to the music. These speakers support a sturdy design for outdoor use and are damage resistant. 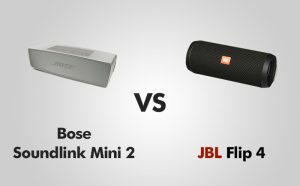 Here is a comparison between two of the popular Bluetooth speakers in the market – Bose SoundLink Mini 2 and JBL Flip 4. Bose Bluetooth speaker is lightly curved aluminum brick and small, you can easily grasp it in one hand. The speaker feels robust and looks tough. However, with its long and deep design, it does not fit in your pocket, but you can easily carry in your bag/pouch and listen to music while on the go. With its charging dock as a bonus, you can conveniently use it both indoors and outdoors. You can now wirelessly charge Bose Bluetooth speaker with the dock but the option of using charging cable is provided. Place the speakers on the plastic dock and the unit charges upon contact. The metal in the speakers quickly transmits electric charge suitable for powering up this listening device. To prevent electric shock, the speakers have rubber-topped buttons on the top plate. JBL Flip speaker design is such that it sits on its side and has a control panel made of rubber material on the back portion. This stops the speaker from rolling and pitches front drivers upwards slightly for better sound performance. Sticking Flip 4 in an upright position is another option available to the users. It has the passive radiator on either side and is equivalent to the subwoofer. For any portable speaker, this one has a great design and is adequately contoured and small to carry single-handedly. This one has a rugged design with no metal to show but has rubber armor sticking out from speaker grille. In comparison to aluminum is more capable of taking a beating at any time. It does not support apt X, higher-quality codec in comparison to Bluetooth SBC standard. There is no a radical change in sound signature for Mini 2 and it has an astonishingly powerful sounding and bass speaker when one compares it to the small size. This is quite boisterous and good fun to use with effective detail delivering well-textured, smooth tone having a mid-range decent presence. This is something more than simply pounding out the bass beats. The vocals are natural and full without undue softening by a high degree of mid-bass. It has a great quality of sound with silkier mids, smoother treble, and deeper bass. This speaker is capable to give a sound higher than the stature as this uses passive radiators. It is not your conventional speaker driver instead complements the standard driver increasing low-frequency sound exponentially. Bose speaker gives the impression of full and deep bass, but it brings out the sub-bass frequencies resulting from limitations of small radiator/driver array. The Bluetooth speaker has much power without the required refinement and subtlety. In such a small speaker, there is great bass though and matches heavy metal in power and depth of bass. Instead of being about tonal brassier balance it has bass grunt that makes the kick drums feel fat and chunky instead of tap on the drum skin. The speaker is great fun having volume in plenty. There is a link between two radiators although they are on both ends of the speaker. When you push one, the other one moves out, keeping each other in check. This helps to avoid distortion from hard working passive radiators. The untamed mids of the speaker gives users benefits when used outdoors and this cuts through effectively. It makes this speaker very useful even if not particularly musical. The speaker delivers a full sound and dramatically deep lows besides being ultra-compact and wireless. Take it everywhere and it has built-in speakerphone to take calls with the clearest sound. Voice prompts means easy Bluetooth pairing and it can play unplugged nonstop for hours and you can charge this with USB sources of power. It has a lithium-ion battery for 10 hrs play after full charging. Pair with any Bluetooth device like your smartphone or tablet easily. Speaker remembers last 8 devices used with automatic reconnect. It is ultra-compact so slips into your coat pocket, backpack, or bag. This next generation Flip series speaker from JBL is portable and delivers quality stereo sound. Powered by rechargeable 3000mAh Li-ion battery, this product offers 12 hours of continuous audio playtimes. It sports waterproof, durable fabric material and is an all-weather, all-purpose companion to take the party anywhere you might like. This also has built-in echo and noise canceling speakerphone facilitating high-quality conference calls. Connect+ technology wirelessly links 100+ speakers with the Connect+ feature to amplify your listening experience. A simple press of the button activates Google Now or Siri from the Flip 4. With this JBL speaker, there are no more worries about spills or rain as you can submerge this in water without any problems. Bose SoundLink Mini 2 is a class product that made meaningful modifications to original and this includes tweaks to sound quality. It outperforms every other Bluetooth speaker in the class and size delivering richer and deeper bass. This is pricier than others though and you would find several quality alternatives at the lower price range. In comparison, JBL Flip 4 does not have a refined speaker and the manufacturer has emphasized on practical application rather than sound quality. It does have a tough exterior and is water resistant with good battery life and handy built-in strap. Focusrite Scarlett vs Clarett – how do they differ? Arx Musica 2017. All rights reserved.